My wife and I first met Amiri Baraka in November 1997, standing in line to get our tickets to a Betty Carter, Joshua Redman, and Maria João/Mario Laginha concert at New Jersey Performing Art Center in Newark. Baraka was directly in front of us! Both Amy and I had been readers of his work since college, were aware of his intensity, and struck up conversation with him. I explained I had been a student and friend of Ginsberg’s, and that I was living and working in Newark. He told us about monthly salons he and his wife Amina hosted at their home, Kimako’s Blues People, gave us his card, and invited us to come over — which we did many times during the next few years. Beyond being a rare social milieu, great performances ensued these nights featuring dancers, actors, musicians, dramatists, and poets. The Baraka’s transformed their basement into a performance space with sound system, lighting, a piano (which they bought when Nina Simone was living with them for a few months in the 80s), and chairs. Everyone was encouraged to read, sing, or play music. Often, jazz bands played well past midnight. Sets by trombonist Grachan Moncur III, Felipe Luciano of the Last Poets, Pedro Pietri, and Sekou Sundiata, were among the highlights for me. Blue Ark — for a long time featuring tremendous bassist Wilber Morris — was the house band and Baraka always performed, proselytized, and educated. The atmosphere was casual yet intense, and these events served as a serious contact point for progressively minded people in the area. Though I sometimes shot Hi8 video tapes when I attended, none of them have been digitized. Baraka was receptive to my interests in his efforts, and my proposals that he and I spend time and work together. Our first engagement on this level occurred when I asked if he would contribute to NJIT’s literary arts publication, Newark Review. He answered the invitation with a newly written (February ’99) long poem, Allah Mean Everything, which I published in print and online in 1999. (A video of Baraka performing the poem at Kimako’s Blues People will eventually be available.) After that went well, I began helping him sell signed copies of his book BUSHWACKED! A Counterfeit Presidency for a Fake Democracy online, which ultimately led to me designing and being the initial webmaster for amiribaraka.com, which I ran until 2005 when M.K. Asante took over (I do not know who is in control now; it looks extremely different). During this period I made numerous recordings of Baraka at public events and in private sessions at his home on at least four occasions. Outtakes of three of these sessions — his contributions to the audio edition of Kenning, edited by Patrick Durgin and I in 2001-02, a session immediately following the 2000 National Poetry Foundation conference (“The Academic Cowards of Reaction”), and a session devoted to reading “Somebody Blew Up America” — are available on PennSound. The transcript of a lengthy discussion about his 60s music magazine The Cricket, which I wrote about in the Baraka issue of African American Review (Vol. 37, Nos. 2-3, 2003), will appear in Hambone 21 (Fall 2014). We were present at Kimako’s Blues People when he read “Somebody Blew Up America” for the first time in early 2002 (a videotape I made that night was never returned to me by the organizers of a festival in Belgium where it was screened in 2004). Though I attended and document two of Baraka’s sessions at the 2002 Dodge Poetry Festival on PennSound, I missed the infamous reading at this gathering, from which “Somebody Blew Up America” went viral and led to Baraka’s dismissal as Poet Laureate of New Jersey. Shortly thereafter, however, I attended and chronicled events where he publically defends himself. At the time I believe these recordings were circulated via the website, but they have been offline for many years until now. Being around Baraka was in all ways amazing — not just because he was a walking, talking history lesson, but due to his integrated practices as an artist. I saw him perform with Blue Ark on many occasions, at Kimako's and venues in Newark and New York [Note: this flickr album is comprised of selected photos from various events I attended]. A set he did with Pheeroan akLaff and Frank Lowe at Fred Hopkins’ memorial was probably the most intense performance of his I ever saw, but he always soared on stage with musicians. 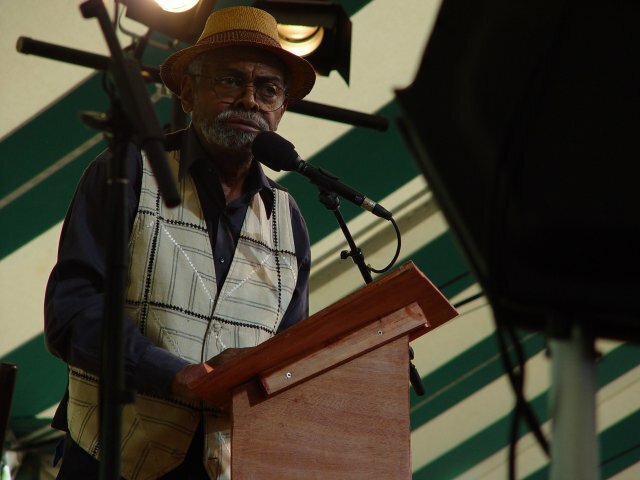 The 2010 recording of Blue Ark included on PennSound, made on a weeknight in a small pub in Newark, aptly documents the group, which combined stellar musicianship (Rene McLean, reeds; Rudy Walker, drums; Allen Palmer, piano; Calvin Jones, bass; Dwight West, vocals) and poetry performances by Amina and Amiri Baraka. When time and technology permit, a video of Blue Ark performing at NJIT in 2000 will be added to this collection. I never ceased admiring Baraka’s dedication to practicing a multi-disciplinary approach to the arts. 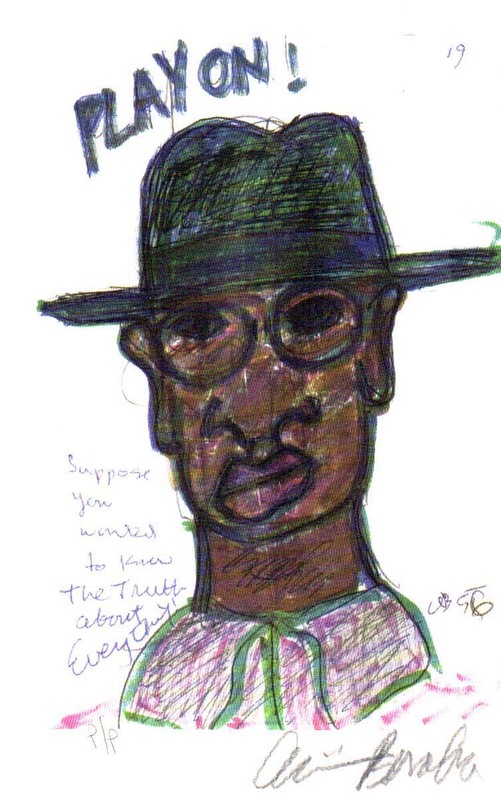 In addition to everything else, he was an active visual artist. His office was covered with dozens of his small colorful sketches (and sequences of sketches), many of which include written narrative. An exhibition of his work, Word Pictures, at the Aljira Gallery in Newark in 1999 was popular and well-received. The image below, from our collection, was created by Baraka; I include it here as a reminder that we all need to PLAY ON! (Nonetheless, I miss him and am sad he is gone).